The new Nissan Armada is a popular full-size SUV. The Armada provides drivers with a number of high-performance features that include a powerful engine and an extended range transmission system. Under the hood, the new Nissan Armada provides operators with 394 foot-pounds of torque driven by 390hp. The Armada accomplishes this feat with the help of 32-valves of dual overhead cam (DOHC) power. The motor also includes direct-injection engine technology that supports its 5.6L, V8 capacity. Direct injection systems provide vehicles with many important advantages. These perks include greater fuel efficiency, increased power output, and reduced emissions. 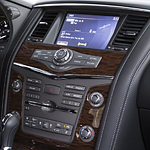 It takes quite a transmission to channel all that raw power, but the Nissan Armada capably does so with its proprietary 7-speed automatic transmission system. This system provides drivers with power at all ranges with specialized downshift rev matching and adaptive shift control technologies.